Last week's challenge: A very elegant challenge this week, which comes from listener Janet McDonald of Baton Rouge, La. Take the initials and last names of two opposing historical figures. Add a C and mix all the letters together. You'll get the title and last name of another historical figure from approximately the same era. Who are these people? Puzzle winner: Margo Huffman of Corvallis, Ore.
Next week's challenge: This week's challenge comes from listener Peter Collins of Ann Arbor, Mich. Think of three words used in golf. Say them out loud one after the other. They'll sound like a group that was in the news in 2016. What group is it? If you know the answer to next week's challenge, submit it here. Listeners who submit correct answers win a chance to play the on-air puzzle. Important: Include a phone number where we can reach you Thursday, Dec. 29 at 3 p.m., Eastern. OK. For those of you who are stuck peeling vegetables or stirring the gravy, it's time to take five. So turn up your radio, find a closet to hide in and get ready to play The Puzzle. How are you doing, Will? WILL SHORTZ, BYLINE: Excellent. Good morning, Ailsa. Merry Christmas. CHANG: Merry Christmas to you, too. Do you have any special Christmas Day plans? SHORTZ: Well, last night, I made Christmas dinner for some visitors from Ghana and Togo, and tonight I'm having dinner with friends. CHANG: Sounds like a fun time. CHANG: All right, so refresh my memory. Tell me - what was last week's challenge? SHORTZ: Yeah, it was a very elegant challenge. It came from listener Janet McDonald of Baton Rouge. I said, take the initials and last names of two opposing historical figures, add a C and mix all the letters together. You'll get the title and last name of another historical figure from around the same era. Who are these people? Well, the people are U.S. Grant and R.E. Lee. Add a C, mix it all up, you get General Custer. That is just brilliant. I have no idea how she discovered that. CHANG: Well, this week's winner is Margo Huffman of Corvallis, Ore. Congratulations, Margo, and happy holidays. MARGO HUFFMAN: Thank you very much. Merry Christmas to you, too. CHANG: So how did you figure out the answer to that puzzle? HUFFMAN: I don't know. I looked at it, and - I even forgot to look at it till Tuesday. And then I immediately said conflict - you know, people in conflict. And I - initials of the generals just popped right into my head. So - then I messed around with it and saw that you could get sergeant out of it, too. But then nothing worked with that and then general and, of course, the letters left - ah, Custer - OK.
CHANG: I hear you are a violinist. You used to play in a symphony orchestra? HUFFMAN: Yeah, for four years - the Rogue Valley Symphony, down in Ashland, Ore. That was, like, 20 years ago. CHANG: How long have you been playing the violin? HUFFMAN: Since I was 12-and-a-half. CHANG: So do you still pick it up and play once in a while? HUFFMAN: Occasionally, not as often as I should. CHANG: All right, Margo. Are you ready to play The Puzzle? HUFFMAN: Oh, gosh. Yes, I guess. CHANG: OK. Well, let's do this. SHORTZ: All right, Margo and Ailsa - since today is Christmas, the theme of today's Puzzle is giving. I'm going to give you two words. You give each of them a letter - it's the same letter in each word - in order to complete a familiar two-word phrase. For example, if I said cat, C-A-T, and aide, A-I-D-E, you would add an S to make cast aside. HUFFMAN: So you can put the letter in the middle. It doesn't have to be on one end. SHORTZ: Could be anywhere in the word. OK, here we go. Number one is singe, S-I-N-G-E, and fie, F-I-E.
HUFFMAN: One would want five, but where would you put a V in singe? Single and file. SHORTZ: Raft, R-A-F-T, and boar, B-O-A-R.
SHORTZ: Oh, that was fast. SHORTZ: Dive, D-I-V-E, and though, T-H-O-U-G-H.
SHORTZ: Pone, P-O-N-E, as in cornpone, and boot, B-O-O-T.
CHANG: I think I know. SHORTZ: Phone booth - add an H.
SHORTZ: Back, B-A-C-K, and bet, B-E-T.
HUFFMAN: Black - black belt. SHORTZ: Black belt is right. Food, F-O-O-D, and pain, P-A-I-N.
SHORTZ: There you go. Shot, S-H-O-T. 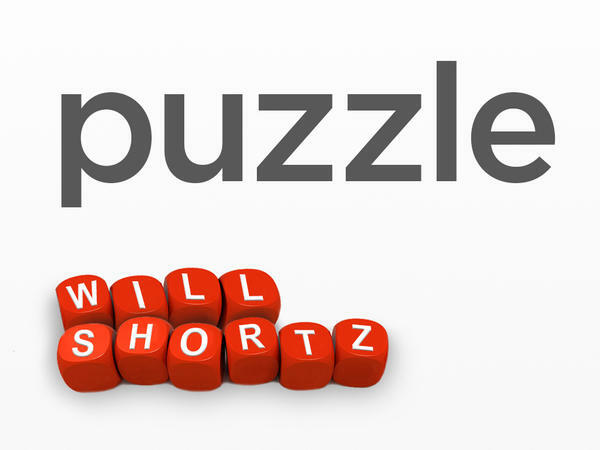 Shift, S-H-I-F-T.
SHORTZ: Short shrift is right. Try this one - spry, S-P-R-Y, pint, P-I-N-T.
CHANG: Oh, look at you. SHORTZ: Thin, T-H-I-N, tan, T-A-N.
SHORTZ: Oh, that's fast. Hose, H-O-S-E, and acing, A-C-I-N-G.
HUFFMAN: Oh, OK. Horse racing. SHORTZ: All right, here's your last one - log, L-O-G, and rage, R-A-G-E.
SHORTZ: Long range is it. Good job. CHANG: That was awesome, Margo. CHANG: And for playing our Puzzle, you will get a WEEKEND EDITION lapel pin as well as puzzle books and games. And you can read all about it at npr.org/puzzle. Margo Huffman of Corvallis, Ore., thank you so much for playing. HUFFMAN: Thank you so much. I appreciate it. Merry Christmas to both of you. CHANG: Merry Christmas to you, too. And what's your public radio station? HUFFMAN: It's, I think, KWAX down in Eugene. All right, Will - well, what is the challenge for next week? SHORTZ: Yes. It comes from listener Peter Collins of Ann Arbor, Mich. Think of three words used in golf. Say them out loud one after the other, and they'll sound like a group that was in the news in 2016. What group is it? So, again, three words used in golf. Say them out loud one after another, and they'll sound like a group that was in the news in 2016. What group is it? CHANG: And when you have the answer, go to our website npr.org/puzzle and click on the submit your answer link. Just one entry per person, please. And our deadline for entries is Thursday, December 29 at 3pm Eastern. So include a number where we can reach you at about that time. And if you're the winner, we'll give you a call. And you will get to play on the air with the puzzle editor of The New York Times and WEEKEND EDITION's puzzlemaster Will Shortz. Thank you so much, Will, and happy holidays to you. SHORTZ: Thank you, Ailsa. Happy holidays to you. (SOUNDBITE OF VINCE GUARALDI'S "LINUS AND LUCY") Transcript provided by NPR, Copyright NPR.